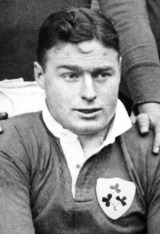 Between 1925 and 1934, Eugene Davy played 34 times for Ireland, mainly at stand-off but seven times as a centre, and he was a key part of a side which shared the Five Nations championship several times. Stocky and strong, he was a forceful runner and hard tackler. He took a degree in legal and political science at University College Dublin and played in the college team, before moving on to the Lansdowne Club where he was pivotal in them winning the Leinster Senior Cup five years in succession as well as the Bateman Cup (the all-Ireland championship) three times. In 1931 the entire Irish three-quarter line against Scotland came from Lansdowne. He captained Ireland in 1933 and against Scotland at Murrayfield in 1930 he scored three tries in a 20-minute period. After retiring he retained connections with the game as a coach and administrator, and managed Ireland's tour to Australia in 1967, and was still attending internationals after his 90th birthday. He worked in his father's business before joining his elder brother as a stockbroker in what they grew into Ireland's largest firm. A devout Catholic, he was actively involved in many charities and in 1972 received a papal knighthood.